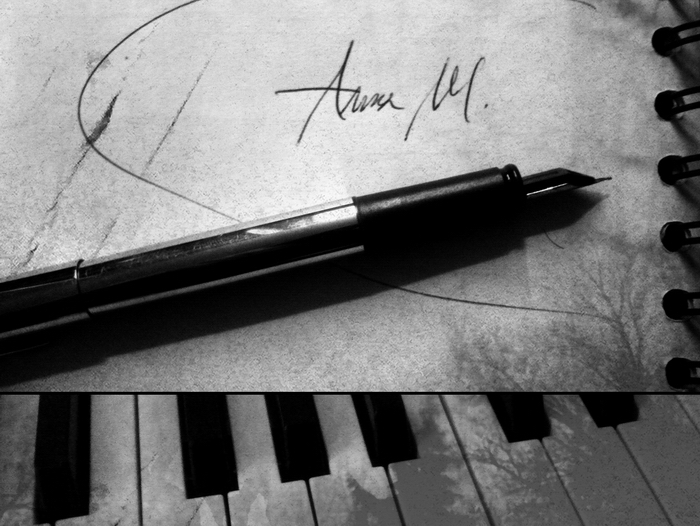 Aube Grise © Anna M.
Aube Grise is the musical moniker of Anna M., composer, visual artist, poet & Distant Voices' photographer & graphic designer. haunted field recordings to (un)reveal ghostly melodies. Atmospheric, epic & emotional black metal builds a path towards modern classical & experimental movements (with sometimes the help of Thomas Bel involved in synths, electronics & clean voices). A romantic work inspired by underground films, old photography, poetry & inner thoughts. 06_83, Album, Cdr, Limited edition, Distant Voices, TBR 2019. Murailles, hiver, Ep, Tape, Limited edition, Distant Voices, 2018. Shale/Arrache-moi, Concept ep, Cdr, Limited edition, Distant Voices, 2018. Abandonnée, Concept ep, Cdr + short experimental film, 5 years gift edition, Distant Voices, 2017. L'Encre et la terre, Concept ep, Cdr, Limited edition, Distant Voices, 2017. Hanterieur, Ep, Cdr, Limited edition, Distant Voices, 2017. Mauvais Augure, Album, Cdr, Limited edition, Distant Voices, 2016. Feue, Album, Tape, Limited edition, Distant Voices, 2016.